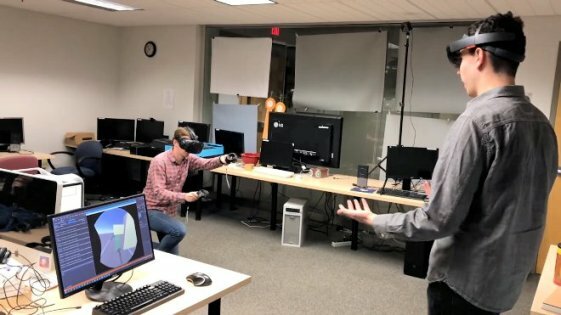 Drew Gottlieb, a student of computer science at the Rochester Institute of Technology, has shown a first preview of what we can achieve if we combine HTC Live and Microsoft HoloLens, or what is the same, a kit of virtual reality and kit of augmented reality. The result is quite interesting, because the project proves that you can do both devices to share information to give shape to this to a new reality in which the user who wears the HTC Live creates objects with total freedom that can be seen by the one who carries the HoloLens. The application that enables this “magic” is HoloViveObserver, which has been developed by Gottlieb himself, who has decided to share it with the world through the GitHub repository. You can download it through this link. Although the idea is still at a very early stage and showing obvious limitations, it is impossible to deny that it has potential, and much, in fact, just thinking of the possibilities to realize it. Imagine for a moment an advanced version that allows creating complex environments and by using additional accessories can receive simulated stimuli of the above mentioned environments. With this set of elements could be set for example entertainment venues in which some professionals believe augmented reality environments according to our desires, and which also could get to feel them.